7sep8:00 pm- 10:30 pmBallaRatCat Comedy - Friday September 7thwith NICK CODY! Get ready to enjoy Ballarat’s best night out with big laughs, great acts you know and love, tasty food and good times galore. Nick Cody: As seen on Conan, MICF Gala, The Merger, Kinne, Talking About My Generation, Have You Been Paying Attention, and many a beer commercial. Nath Valvo’s hilariously physical, high-energy comedy is impressing critics and winning crowds across the globe. His show won Best Comedy at this years Adelaide Fringe! Alex Ward is a Melbourne based stand-up comedian and is currently achieving her life long dream of being brave enough to live outside her home state of QLD. Alex believes her comedy will fill you with some anxiety and then warmth and then self belief and then hope…and maybe love. Tim Young is doing big things in the Ballarat comedy scene, establishing and helping out new rooms, and performing plenty of great comedy himself, with a new weekly spot on ABC radio to boot! 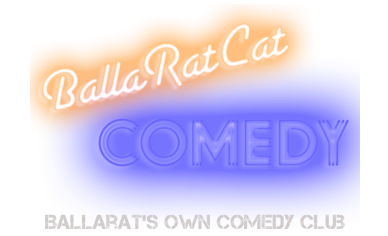 Spread the word and get your tickets for the big return of BallaRatCat! Check out rest of this site for all the information you could possibly need, and likey-follow* us on facebook and twitter for all the latest info!